Over 700 people attended NJA’s founding conference on December 25, 1980, and over 300 were turned away for lack of space. The choice of date was not random, as Christmas is usually a day when American Jews face alienation in our officially secular, but Christian–dominated, national culture. The conference featured a few different tracks: educational sessions focused on Jewish progressive approaches to historical and modern political and social issues; creation of a “conference community” through religious and cultural events, caucuses, and get-to-know-you exercises; and, not least important, the work of creating a national organization through work on a Conference Unity statement, By-Laws, and Taskforces. Banner image from 1985 NJA Convention. Photo by Jacob Bender. In a 1981 article in the New Jewish Times, conference attendee Jonathan Mark offered an entertaining and enlightening retrospective of the decision-making process of the NJA conference, which I draw from throughout the following section. Mark notes that on the second day of the conference, Thursday, a vote was made to formulate not only a broad unity statement, but also specific amendments on controversial issues (especially the Middle East). Though work to create the Unity Statement had been going on for over six months leading up to the conference, there would only be two days for writing, debating, and voting on the amendments. Mark, who was critical of the decision to take on controversial amendments, felt that the Leftist Caucus had dominated the hearing on Saturday’s voting process. An all-group Havdala (ending Sabbath) service at nine o’clock on Saturday night brought the attendees together in a moment of holding hands and singing. Then the lights came on and it was “time for battle over agenda by-laws.” Some conference attendees had spent the past two days creating a proposed set of by-laws, but the rushed group process yielded a relatively meaningless document. Word-by-word debate over the by-law proposal went on for hours, as Mark explained “the procedure is almost paralyzed from the start by games of parliamentary jabberwocky and Talmudical fishing expeditions in which trivial ‘points of procedure,’ ‘points of information,’ and ‘points of clarification’ produce a de facto filibuster by delegates from across the spectrum.” By half-past midnight only 492 of the 700 conference attendees were left, dropping away from the tiresome process in streams and floods. Quorum called for 328 votes. Merry Pranksters walk around with balloons and scaffolding on their heads, mimes clown and juggle in the aisles, jokes are exchanged about a new organization for militant feminists and gays entitled ‘New Jewish Gender.’ And, to parody the dozens of single-issue caucuses, a Jew playing possum is carried to the center of the stage and announced as ‘the Dead Caucus,’ representing dead Jews everywhere and their contributions to Judaism. 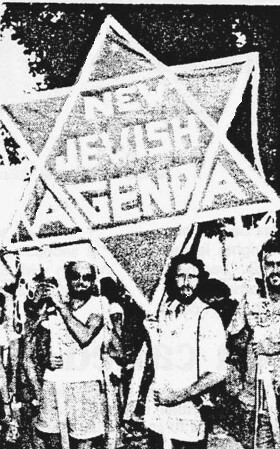 NJA eventually agreed on five primary campaigns: Israeli and Palestinian Peace; Worldwide Nuclear Disarmament; Economic and Social Justice; Peace in Central America; and Jewish Feminism. Taskforces coordinated these campaigns, and each had a representative on the National Steering Committee (NSC). There were also smaller Working Groups within taskforces and many shorter-term campaigns and strategy conferences. 1 these resolutions were carefully and specifically worded. In this list I offer only brief headings to reflect the general meanings of the proposals. Rally image from NJA Newsletter # 13, Fall 1983. March for Jobs, Peace, and Freedom. Photo by Jacob Bender.